There's a new member of the No Poster Family. 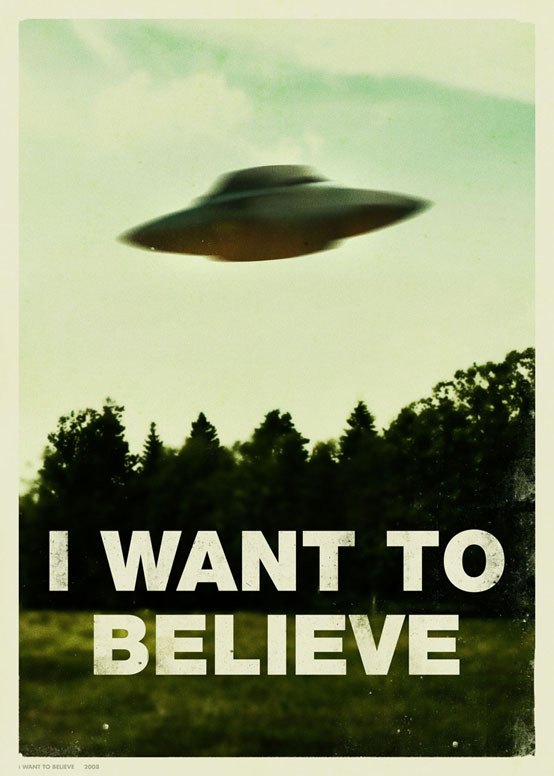 It's called I Want To Believe, and it's a remake of one of my one of my all time favourite posters. Some of you will recognize the theme of the poster from the TV series, The X-Files, where it graced Mulders office-wall. That poster, in turn, was—for copyright reasons—a remake of the original one. It's all in this digital pamphlet by Famous Pictures Magazine. The poster was an apt choice for Mulders wall, as the basic log line of the whole show might as well have been the believer and the skeptic explore the supernatural. There's a subtle both hilarious and spot on sarcasm to the original poster. People, we, mostly everyone, wants to believe. We want to believe in UFOs, we want to believe in god, we want to believe in the easter bunny. Some of us don't believe in either of those, but most of us want to. Wow, yeah, I should’a totally done that! the poster is really really grate!!!! !